It’s a week of firsts and lasts! Welcome to the first of the weekly December challenges, and the last Gateshead challenge of the year (where has the year gone?!). 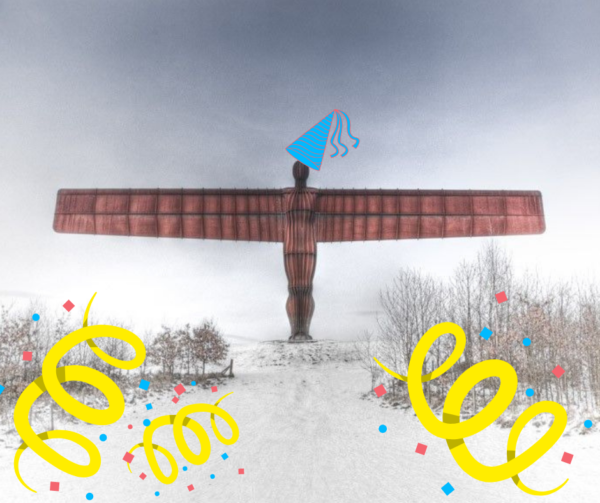 We’ve had regular challenges in celebration of Gateshead’s Angel of the North 20th birthday. We’ve written birthday cards, made models of landmarks, become local historians and told the story of a statue, all in honour of one of the most talked about and recognised pieces of public art in the UK. In true 20th birthday style, and to mark the end of the Gateshead challenges, this week is going to be fun. We would love you to…. Celebrate! We challenge you to find your moments of celebration through out the week – the big, the small and the in between. Celebrate your successes and those of the people around you; celebrate the end of a long day, and celebrate the beginning of another one. Celebrate them in the best way you can – can you mark the moment in a creative way? Maybe with a song, a dance, through writing, by trying a new recipe or simply taking the time to talk and acknowledge the moment. Tell people, celebration is contagious….! Celebrations and dancing are the best of friends. Can you create movement inspired by the Angel of the North herself? With your arms stretched and your head held high- give it a go and dance like no ones watching. How does celebration make you feel? How did you find the process? Did you manage to find moments of celebration in each day, and how did it impact the rest of the day? How did you choose to mark the moment, and why?